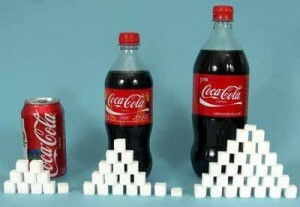 Does soda pop affect performance? The majority of American’s are overweight or obese for a reason.I believe this is largely due to the “empty calorie” consumption of soda pop and the increased use of convenience foods. While there are many other factors that lead to fat American’s like fitness (or lack of it); a large factor is diet.Unfortunately soda pop is a staple in the average American’s diet today.Let’s consider the ramifications of this lifestyle choice.Over the many years as I have worked as a weight loss specialist I would say the majority of the people that I have worked with that wanted to lose weight drank an average of three 12 once sodas a day before starting the program.This is about 130 grams of sugar or 520 empty calories.To burn this off an average 150 pound person would have to run about between 3.5-4 miles.Alright, so let’s say they decided to switch to diet soda after they figured this out.No calories no problem right?True no calories, but what about the other substances found in soda? Like the well know cancer causing carcinogens and phosphorus?Extra phosphorus in the body is excreted through the urine and is accompanied by calcium which is often lost in the urine.If the body doesn’t consume adequate amounts of calcium (soda often replaces milk in the diet) then the body takes calcium from the bones often making them porous.This leads to osteopenia and finally osteoporosis, a painful chronic condition.This once “aged” disease is now being seen in children and this is largely due to soda pop consumption. So let’s say you are a full-sugar soda drinker – no diet for you – yuck!Let’s explore for a minute how sugar can affect you.A large bolus of sugar at one time (over 45 grams found in most 12 ounce cans of soda) will cause the blood sugar to raise quite suddenly triggering insulin production.This can also triggers a hormonal response which can eventually leave to a feeling of being tired and makes us feel hungry even when we are really not.This leads to over eating and weight gain which is not going to help with performance. Another chemical found in soda is caffeine.Although caffeine can be a performance enhancer when used properly, it is also a well-know diuretic and leads to water loss.If you are trying to lean up you need water.Have you seen a steak dry out to be a piece of beef jerky?Simply muscle is made up of water and if you aren’t getting enough water you will not build muscle.People that drink soda in place of water are missing out on the benefits of a well hydrated body.Hydrated body tissues perform and function better.Soda pop gives you very little water and often requires more water to process the chemicals in it.Another thing to consider with soda consumption is the dehydration.Soda drinkers often consume pop in lou of water, combined this fact with a soda containing a diuretic (caffeine) then the individual is in a constant state of dehydration.One of the many symptoms of dehydration is impaired ability to think clearly.I don’t know about you, but I want to think clearly during my training and in a running race or triathlon.Soda pop simply does not help you. Lora Erickson is a competitive runner and triathlete with over 25 years of experience.As one of Colorado’s top distance runners, she was heavily recruited by various colleges throughout the US.She graduated from Utah State University with a degree in Health Education and duel minors in Nutrition & Chemistry.While running for college on scholarship, Lora earned the title of All-Conference Runner (top ten of all western states colleges).She is the owner of Blonde Runner Health LLC in Bountiful, Utah where she currently resides with her husband and four children and has been coaching since 1996.She has a true passion for health promotion and welcomes questions and comments.Contact her directly at lora@blonderunner.com or visit www.BlondeRunner.com for more information on services available.